An ideal solution for parents and coaches alike. The Xtreme Sport Soccer Tactics Coaching Board is the solution you need to visually represent drills and setup plays during practice or games. Using the realistic turf colored whiteboard and included dry erase marker you’re able to help plan, teach and win those game altering plays! A Must have for Every Coach or Soccer Enthusiast! Xtreme Sport DV brings premium quality long lasting sports and agility training equipment to the masses. All our products are covered under our 100% satisfaction guarantee with a 1-year warranty against manufacture defects. If you’re not satisfied with our products or have any additional questions, we encourage our customers to reach out and contact us. 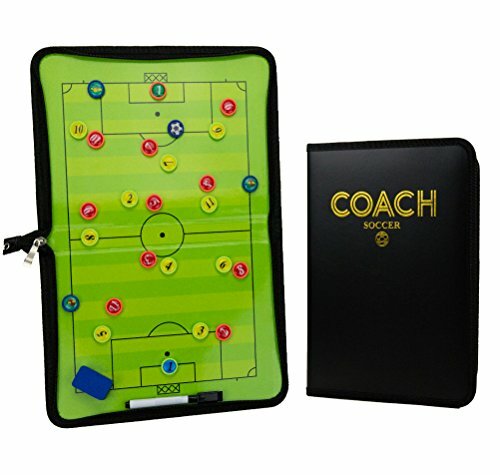 Premium quality synthetic leather 16" by 10.5" soccer/football tactics board in convenient zip-up binder format. If you have any questions about this product by Xtreme Sport DV, contact us by completing and submitting the form below. If you are looking for a specif part number, please include it with your message.